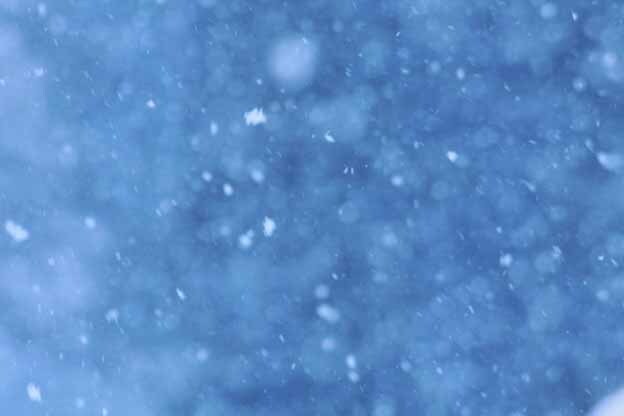 The Emerald Ash Borer presentation scheduled for Tuesday, March 20th has been cancelled due to impending snowstorm. It has been rescheduled for April 17th. Hope to see you then instead. In the meantime, stay safe and warm. 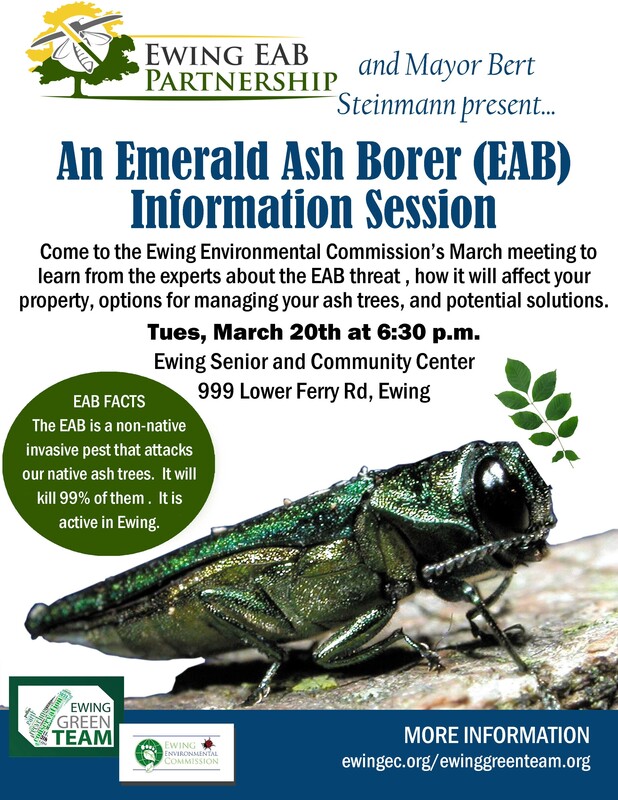 Come to the Ewing Environmental Commission’s March meeting to learn from the experts about the Emerald Ash Borer (EAB) threat, how it will affect your property, options for managing your ash trees, and potential solutions. Sometimes, when you look forward to doing Feeder Watch each week, you build yourself up by expecting to see something new (a new bird, a record number of one Species, a bird that shouldn’t be in this area, etc.). This past weekend was not a good one for that because it combined a number of different weather related events To keep the numbers quite modest. The rain started early Saturday afternoon, and didn’t stop until late on Sunday afternoon, that wasn’t fun. Higher temperature may have had an effect too. We’ve been averaging around 45-50 Goldfinches for the season, but saw only 8 while we were watching! Likewise, White-Throated Sparrows were down to three, Mourning Doves were 10 and House Finches just four. On the other hand, Cardinals were seven, pretty high; it was fun to watch them zooming around the safflower feeder and perching on the Sunflower Hearts feeder, and then sitting on nearby branches watching others. Several species were higher than normal, three Downy Woodpeckers and TWO Hairys, three Titmice, three Carolina Chickadees and a relative, one Black Capped Chickadee. The temperature was pretty mild when compared with weekends past, and it got over 60 degrees Fahrenheit on Sunday, which had its effect too. Strangest of all was something we didn’t report to Feeder Watch: on Wednesday a.m. around 0800, we counted 83 Goldfinches on our feeders, the deck rail, the deck, in the trees and around the Sunflower Heart feeder!!! Maybe they were stocking up for the seasonal change which will take them elsewhere, it was quite a sight. Six weekends are left in this season’s Feeder Watch reporting; we’re looking forward to reporting some Pileated Woodpeckers if we’re lucky. They’re around; we saw one on an early morning dog walk this week, so maybe we’ll report our first for the year hammering away at the suet next weekend. Here’s hoping. It wasn’t quite as cold this past weekend, and that might have accounted for our seeing one species fewer, but 55 fewer birds among the ones we did. When you compare the numbers of Goldfinch with last weekend and this, it was 54 v. 29; Juncos were 16 v. 9; White-Throated Sparrows were 19 v. 7 and Mourning Doves were 20 v. 14….and the Flicker seen last weekend didn’t return 😦 . The rest of the supporting cast was there, as always: Carolina Wren, Titmice, Cardinals, White-Breasted Nuthatch, three Downy Woodpeckers, one Hairy and two Red Bellies. There may be another thing at work….squirrels! We normally spread seed on the ground beneath both our Sunflower Hearts Squirrel Buster feeder, and the Safflower tube feeder because we’ve seen, over the years, that some birds are ground feeders, and don’t go to a suspended Feeder. White-Throated Sparrows, Juncos and Mourning Doves are ground feeders, while House and Goldfinches prefer feeders…but what if the ten fat squirrels that hand around our feeders are the cause of the White Throats and Juncos shifting their feeders some? Could that account for the greater numbers of same we’ve seen on our deck, where we spread the Thistle (Niger) seed, as well as be a deterrent for other hungry birds? Time will tell, so be sure to tune in next week for the results of Feeder Watch for 1/20-21. 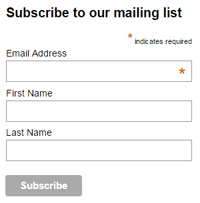 This was our 231st submission to Feeder Watch, and it’s more enthralling than ever. With the bitter cold, and snow still on the ground, we expected a big number of birds this past weekend, and weren’t disappointed. It seemed like there were hordes on the feeders, whenever we looked out the window at our deck or at the lower yard, under the feeders or suet, … and don’t forget the water. On Saturday night I emptied the water out of the bird bath, carried the rocks, water heater and bird bath into the kitchen, cleaned the moss off everything, and then ran it all through the dishwasher so the birds would greet Sunday, the coldest day so far, with clean, warmish water and clean rocks to perch on. The effort was rewarded by a Northern Flicker late Sunday a.m., who flew directly onto the deck rail, jumped onto the side of the bird bath and took many swallows of water, and also wiggled his face in it!! What a treat to see such a beautifully colored woodpecker within ten feet, and to watch while he tanked up and washed his face. When he flew off he didn’t stop for any suet or Sunflower hearts, he just went (but he came back the next two days around the same time, so maybe he’ll be a regular). Aside from that thrill, it was interesting to see how two species which are mostly ground-feeders here, the Northern Junco and the White-Throated Sparrow have expanded their ranges in our yard. Normally seen underneath the Safflower or Sunflower Heart feeders, we now see them on the deck where we’ve spread Niger seed for the Goldfinches. Juncos, in fact, take over the deck (but not the deck rail), and we’ve counted more than twenty of them having an early breakfast there. The White-Throated Sparrows have started to appear on the deck, but not in the same numbers, and they are still mostly under the Safflower and Sunflower heart feeders….still, to see fourteen White-Throats on the deck at one time is unusual. One thing particularly evident this weekend was how the different species which feed together under the feeders get along so well. It was particularly evident under the Safflower feeder where Mourning Doves congregate. This time, in the early afternoon, they were joined by Cardinals (male and female), White-Throated Sparrows, House Finches, Juncos and Carolina Wrens. Each was busy pecking at some loose seed, but none was paying any attention to the other birds. The only upset came when the Squirrels (there are about ten, rambunctious and well fed) ran through the feeding area scattering everyone…but it was momentary, and order was soon restored. For the week we bought another 40# of Niger Seed as we’ve been running through it at a great rate, now that we’re also spreading it on our deck. Next week we’re going to keep an eye out for Pine Siskins (which look like a cross between a Goldfinch and a House Finch, but aren’t because those two species don’t hybridize). If winter supplies for them in Ontario run short, they’ve been known to come south looking for food. In 2009 there was just such an irruption, and we saw a few at first, but then reported a maximum of 55 in one weekend before they started tapering off. Our cat will help us look too, as she sits on her cushion and watches the deck activity each day. At 0715 on Saturday a.m., I opened our bedroom curtains to the backyard and saw a Coopers Hawk sitting on a horizontal branch 20′ from me. He was looking west, and fidgeting hungrily, but staying where he was. A quick check of our deck and yard feeders showed no birds at all….they’d sensed his arrival and disappeared, a good thing because Coopers Hawks prey on birds, and we’ve found remains of Doves and Titmice that they’ve probably done. Before long the hawk was gone and things began to return to normal. Our deck, where we have the two Thistle feeders plus spread seed on the deck rail and on the deck itself were doing a land office business: fourteen Juncos busied themselves on the deck itself poking around in the Thistle seed (they like to poke around in the vines at that level too; on the deck rail, and on the Thistle feeders themselves, we eventually counted 33 Goldfinches this past weekend, a few were in trees waiting for their turns, and a couple were on the Sunflower feeder, but most were on the deck rail and the two feeders there. A lone Song Sparrow was also spied among the Juncos on the deck; they’re not often seen. The suet feeder, hung off a cable between a Dogwood and our deck had a nice collection of clients, and a new peanut butter suet cake to boot. The three woodpeckers, Red-Bellied, Hairy and Downy were all on it, but also the White-Breasted Nuthatch was seen, as was the Carolina Wren. Other species like Juncos and White-Throated Sparrows will sometimes station themselves below the suet, on the ground, to catch extra pieces as they’re ripped off by the bigger woodpeckers….you should see the mess a Pileated Woodpecker makes, with its massive bill…. but it helps the small fry share in the booty. Since it snowed later that morning, there were a few more species than usual, two English Sparrows showed up to go along with the Song Sparrow, but the Grackles and Crows from a few weeks ago weren’t close enough to be counted. The Safflower feeder had its usual collection of Carolina Chickadees and Tufted Titmice taking a seed at a time, flying to a nearby branch, pounding on the seed and eating it, and flying back for more. On the ground below it, Mourning Doves, Carolina Wrens, Cardinals, White-Throated Sparrows and House Finches poked around. On the other side of the bushy Holly which provides cover, the Sunflower feeder was mobbed by Goldfinches, House Finches, Blue Jays, Cardinals, the Red Bellied and Downy Woodpeckers, and White-Breasted Nuthatch, while the squirrels gobbled up what had been spread on the ground for the White-Throated and English Sparrows, and Cardinals, Doves and occasional Carolina Wren. It was a satisfying weekend for Feeder Watch, and the birds knew that we bought another 20 pounds of Niger Seed, 40 pounds of Sunflower Hearts and 16 pounds of Safflower Seed to go with six more cakes of suet….they’ll be back next weekend to do their part (of course they’re fed on a daily basis, and we’re adding much water to the heated basin they use…, and will clean it next weekend, weather permitting). It is colder than we can remember, so make sure your birds have food and water for they depend on us. The Grackles and Crows seen recently had family obligations elsewhere over Christmas, so did not show up at our feeders either day. However, it was not a total loss because The Red-Tailed Hawk was back, this time late morning on Saturday. Instead of sitting on a branch and looking directly into the house, he chose to sit about 50′ up an Oak tree, where a big limb branched off from the trunk…there was a superb view of our feeders, but he wasn’t inclined to get any closer, which proves that he’s not preying on birds. Had he been a Cooper’s Hawk or Sharp-Shinned Hawk, that would not have been the case, and ALL feeder activity would’ve stopped until the threat was long gone. The number of Mourning Doves, while not setting records, changed because, of a sudden, they’ve discovered that we’re spreading Niger Seed on the deck rail for The Goldfinches, and half of the 24 we saw were on our deck! (Since we have feeders in three different locations, the highest number of a species we see at any one time includes all three feeders plus any others of that species waiting their turn in the trees. Goldfinches and Mourning Doves spend a lot of time perching in the trees before finally coming to the feeders. Feeder traffic starts to dwindle around 3:30PM these days, but that’s a good time to see the ones who are late feeders, principally Cardinals and White-Throated Sparrows; that’s how we noted seven of the latter this time. So far this season, in six reports, we’ve seen 19 species, with House Sparrows already showing up twice (practically never in the past 12 years). At the same time it appears that there are fewer Red Bellied and Hairy Woodpeckers than usual, but slightly more Downy Woodpeckers. The rest of our visitors are about in the same numbers as last year. I’m trying something different with this report….showing the % of FeederWatch reporters who report the birds we saw. That’ll give you an idea of the rarity, or not, of what we’re seeing. I can’t edit the FeederWatch chart, so here’s a rudimentary chart by species, % reporting it in SONJ, and what we saw. What surprises me is that Hairy Woodpeckers were in the 30’s last year, and it was the first I’d seen this year (Ann sees them during the week). We Used to get the Brown Creeper regularly, one or perhaps, two…but they started disappearing late last year and are now seen by only 1-2% of those Reporting, down from 4-5% last year. On the other hand it appears that Carolina Wrens are being seen by more as their numbers were in the low 30s last year. The best sighting was the young Red-Tailed Hawk. It was later on Sunday, about 3PM, and he flew in and perched on a Sassafras branch looking right into our family room. I looked at him for 10″ and he flew off to another house, but the thing that impressed me most was that five or six Mourning Doves continued to feed about 20′ behind him, paying him no heed and vice versa. He looked just like he does in Sibley: Big, clear white patch on the upper part of his breast, streaked below and above that, and definitely not a Coopers Hawk (no white patch, size, slim, gray). What a treat. Snow was in the air; we noticed this on Friday when larger numbers of birds were at the feeders, which repeated on Saturday, when it started snowing around 0800, and didn’t stop until early morning Sunday. In the interim we probably had 6″ of loose snow and more activity at the feeders than normal. It helped that we were able to spend more time watching too, and an overnight guest, who has written six books about birding in South America, was happy to sit and check the feeders with us on Sunday morning. Early on Saturday morning four Crows were in the feeding area; their presence discouraged other birds from getting food, but the Crows didn’t get much other than water because the safflower’s in a protected tube, the sunflower feeder has a weight ring which closes when something that heavy jumps on it, the suet cage is Too small for their size, and the Niger seed wasn’t to their liking….but they were there and recorded. Three different woodpeckers favored us, the reliable Downy pair, and a Red Bellied Woodpecker kept coming back to the sunflower hearts. There was a Hairy sighting on Saturday a.m. which was much anticipated since the Hairy is a neat bird. The biggest surprise of the weekend came around 4:30PM on Sunday, just as all birds were calling it a day, when a Hawk flew in! This hawk, which turned out to be a Cooper’s Hawk, flew to four different places trying to find something to attack: he was on the Sassafras tree first, but moved to the Dogwood’s top…no luck at either, so he then hid in the Hemlocks at the back of the yard, but was impatient and flew off after thirty seconds. He was about 15-16″ in length, but the key I use is that the corners of his tail were rounded, unlike those of the Sharp-Shinned Hawk, whose tail corners are square. But, with the appearance of the Coopers Hawk, we were able to log sixteen species on this snowy weekend. Still puzzled by the absence of the Hairy Woodpecker (seen once in three times), and the Red Bellied Woodpecker (twice out of three, but only seen once each time when there Are usually multiple sightings of both on weekends). Goldfinches were down A LOT from first two weekends, maybe it’s weather related. Mourning Doves down too, and only saw them once…but I’ve got to spend more time watching. Highlight of the weekend was the Carolina Wren which, yesterday, busily inspected a cluster of small brown pots we have Hanging on a lattice. It went into one pot so all you could see was its tail sticking out, inspected, turned around and went on to the next, and repeated – very heart-warming. The secret (major) to the ones we do get is that we have heated water available on our deck rail…a Chickadee and the Carolina Wren shared it yesterday, the Blue Jay bathes in it, Squirrels love it, all birds need a source of water when it freezes, so our supply of same attracts many. Feeder Watch has started again, but our cat, Reina, doesn’t seem as interested in it just yet. Maybe it’s because the bird count is down and we’re still waiting to see more consistency among the Woodpeckers. E.g. The Hairy and the Red-Bellied were seen only once, the Hairy last week and the RBW this week; they are usually Guaranteed visitors. Same goes for the delightful Carolina Wren, who pokes around under the Safflower feeder getting what’s jettisoned from above by the Titmice, Carolina Chickadees and House Finches (it saves squeezing into the protected feeding tube). Last weekend, the first, also had no White-Throated Sparrows, but there were 8 English Sparrows (down to two this past weekend). They’re not often seen at our Feeders. And where is our favorite Brown Creeper? …we only saw him a couple of times last year, and not this year so far. Has his range changed so that we’re no longer in it? Well, only 5-6% of Feeder Watch’s New Jersey contingent (generally more than 200 a week) report the Brown Creeper. Twenty-five years ago The Cornell Lab of Ornithology started Project Feeder Watch as a way to document the movement of feeder birds around the country, and to see what’s happening to them. Now, more than 15,000 participants in all states (and Canadian provinces) report what species they see weekly, and how many at any one time, from November to April. The Ewing Environmental Commission participates in Feeder Watch because one of its aims is to preserve the natural environment in the Township. Participating in Feeder Watch helps do that on a local, state and national basis, by increasing knowledge about what birds are seen at feeders, and with what frequency. Now in its tenth year, more than 160 reports have been filed, and more than 45 different bird species have been seen in that time. Lee Farnham, former Chair of the EC, is our Project Feeder Watch citizen scientist who has participated in the project for many years. He provides updates on the bird counts in his backyard on a weekly basis Look for his results and insights in posts to come. If you choose to purchase a cut tree, try to prevent the cut section of the trunk from being exposed to the air for more than three to six hours; it should be put into a container with water as soon as possible. Next, trim off the lowest branches which might interfere with the tree’s staying upright in a stand, and then remove ragged branch tips or unattractive branches. Saw off an inch of the trunk so the tree can absorb water freely, and fasten it to its stand, which should contain plenty of water. The water, especially at first, should be replenished often. 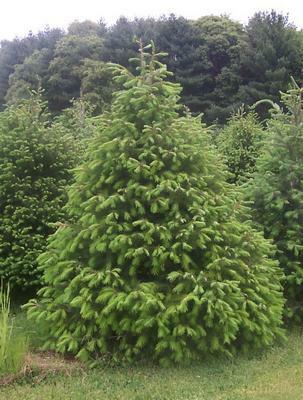 Artificial Christmas trees are often made of PVC, a dangerous chemical, which is not biodegradable, and does not have the wonderful fragrance of a real tree. However, they may be used for many years and are maintenance free. 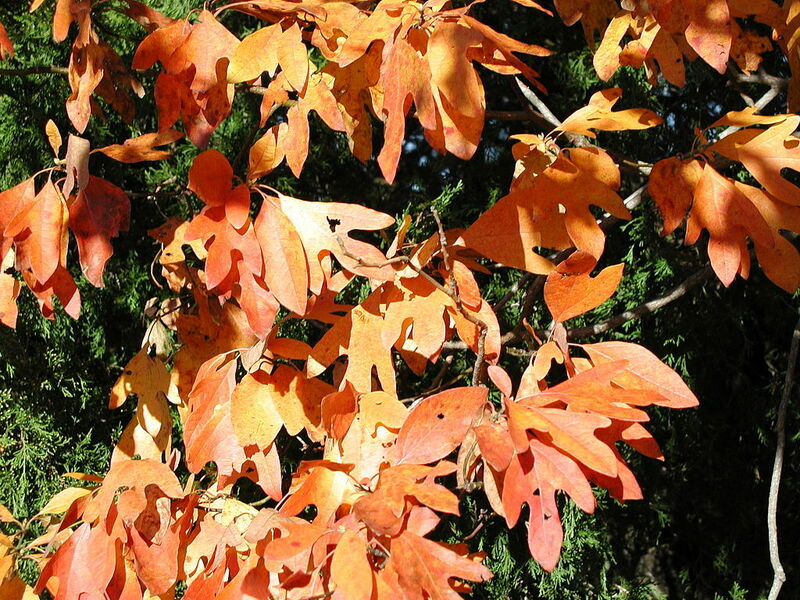 A live tree, while somewhat more labor intensive to care for, may be planted in your yard after its holiday use, and enjoyed for years to come. You must do some planning before you take the tree home but it is well worth while. 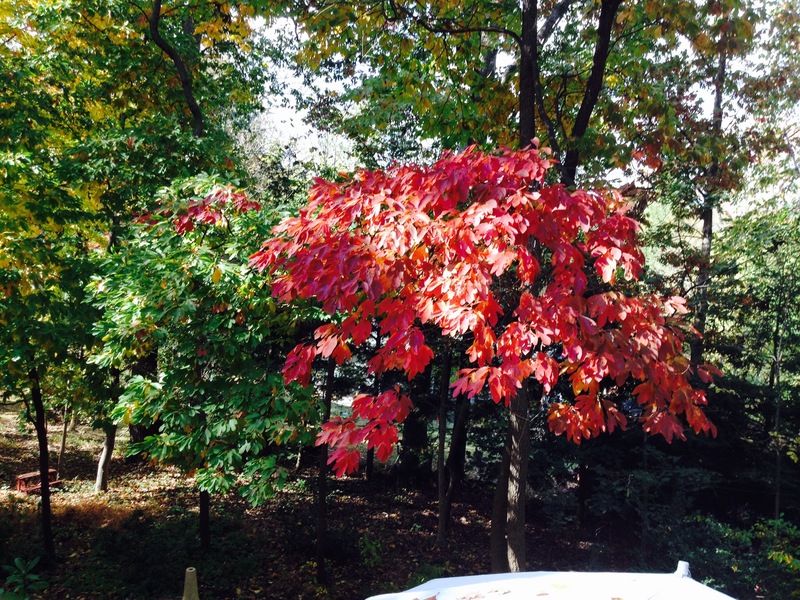 1) Determine what spot on your property affords the correct exposure (full sun) and space. Check a good source or the internet to determine how much space your particular species of tree will require when mature. 2) Dig the hole NOW before the ground freezes. Digging a frozen hole is no fun. Make the hole approximately 2 times the width of what you expect the container or root ball will be. This is important; and do not dig the hole any deeper than the height of the container or root ball. Fill the hole with leaves or mulch as insulation, and cover the hole and the pile of soil with a tarp and more leaves or mulch to avoid freezing. Throw away whatever sod was dug up as you do not want it included in the backfill. Your live tree should be indoors as briefly as possible; place it at first (in a waterproof tub or container) in a garage or porch to allow it to acclimate to warmer temperatures. Water it lightly and frequently, or place ice cubes over the root ball to keep the moisture levels up. Spraying the tree with an antidessicant such as Wiltproof will help control moisture loss through the needles.